For months, I joined the rest of America in a mad race to learn what I could about the presidential candidates before it was too late. I followed each debate (including several third party) and their respective aftermaths with extreme interest. I found myself compelled towards one candidate or another. I learned how closely my ideology aligned with the Green Party, and for a hot second, Jill Stein was my home-girl. Then I felt crushed when my home-girl, who was campaigning for the highest office in the land, had not taken the time to figure out how to make her computer work (it seemed like a problem with her sound in/out settings) for a google hang-out which had been set up as a way of letting the peripheral candidates have a voice. In the end, considering the alternative for this election, I realised the importance of a healthy dose of pragmatism. Looking back, I can’t say that Obama’s victory should have come as a surprise to anyone. Nate Silver has been in the news a lot lately, but if you look at any of the predictions based on the math of poll numbers, historical factors, other measurable stats, etc, rather than pure emotion and personal political agenda like many of us are used to seeing on TV, Obama was in the lead for most of race. And yet I was freaked out right up until Tuesday night at about 11:15 pm (that’s when FB shows I posted a single “:)”. Earlier that day, despite an important call from Haiti and work deadlines, I volunteered with the local Obama campaign team in an effort to feel better, but nothing seemed capable of stopping the feeling that so many social issues could fall into oblivion (or worse…my concern was split almost equally for things Romney had said and things he had repeatedly left un-said). Many had already predicted the outcome (correctly down to state by state outcomes). But the wave still hit hard and heavy as the last minute commentators continued to act as though it was any man’s race. I think Fox News took much of the wave’s impact. Unfortunately, those who had been duped by Fox tactics were hit pretty hard as well. And then there were those of us who just kind of let the current take us. It suddenly felt like I could breath freely again. Things seemed right about the world that prior had been frightening. We’re gonna make it….we’re gonna make it! The next morning, I woke two hours before my alarm was set and didn’t feel the nagging painful woosh of blood in my head that’s existed when I’m sleep deprived ever since the accident. I looked in the mirror and felt like my eye looked almost normal. I looked again, and saw that it still wasn’t, but out of curiousity, I put on a pressure cuff to see what else I could learn. 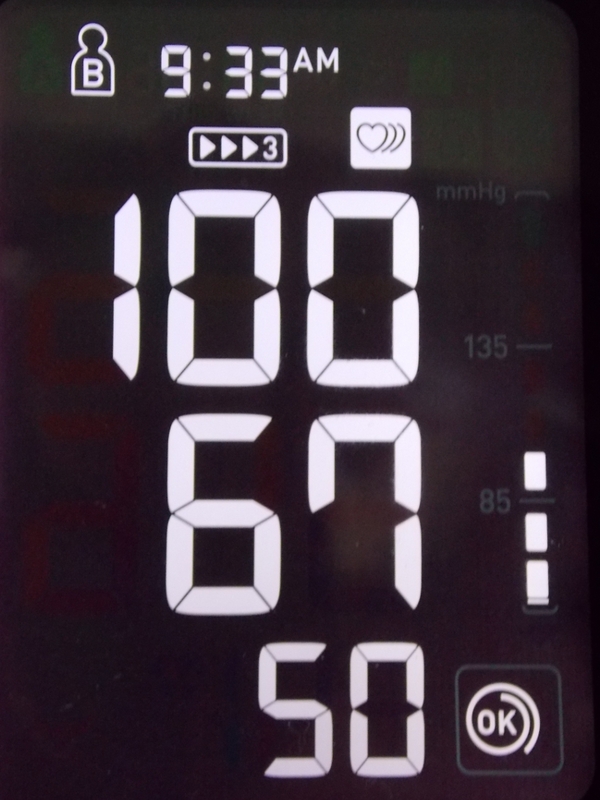 I have NEVER had a pulse of 50 before except for when I was at risk of dying following my accident. For that matter, during the election, my BP was even higher (by almost 20 points on each count). But this, coupled with a feeling of peaceful calm…was validating. I know that not everyone shares my calm brought about by the end of this election. Or some are happy elections are over but not with the result. We all, as Americans, still have a lot to do over the next four years rest of our lives to keep making our world a more livable, safe, and peaceful place for its inhabitants, so I will not pretend my calm comes from a feeling that “it’s all” over. One of the big changes we need to see (now!) is some serious election campaign reform. The money attainable through super-PACs for the right kind of candidate is not only terrible in its magnitude, it is also crippling to many democratic notions of “power to the people”. With little finance transparency and a few heavily vested interests, it is like the makings of a tragic comedy to say that we live in a Democratic nation where the informed populace makes equally informed decisions on matters of importance. The Green Party made this point well when their presidential and VP nominees were arrested for trying to take part in the second official presidential debates. Everyone has a right to run, but not everyone has the same rights concerning how they run. And those that seemed to fall the closest to the middle remained silent. Probably because they didn’t want to get caught in the fire. We need to start talking. With each other, not just to hear ourselves speak. We need to start reaching out to learn how and why the other side does as it does. We need to stop letting ignorance ferment into hatred, and we need to stop getting drunk on the result. At the end of the day, we’re all just people. All just imperfect sentient masses looking for a reason to be. I don’t pretend to know the answers, but I know my thoughts, and I try to reconcile those with the world around me. Perhaps we all do that a little. Maybe it’s time we start sharing those thoughts across party lines. *In this particular instance, I’m actually referring to cleaning the gutters on my house after getting the larger stuff (leaves, sticks, decomposed matter) out. The last step to gutter cleaning was to wrap the hose around to various parts of the house and then flush water down the gutter until it started running clear. The title was obviously not meant as a metaphor. Obviously. This entry was posted in Social Commentary / Other and tagged conversation, election campaign reform, elections, far-right, liberals, Obama, reform, Romney, talking. Bookmark the permalink.